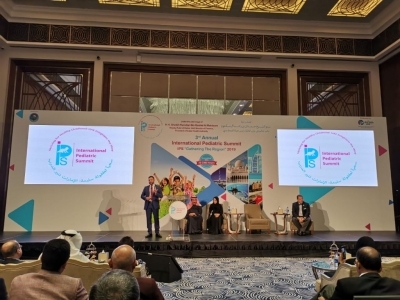 Dubai-16th feb2019: Dr. Ahmad Al Hashemi, Board Member of the Sheikh Hamdan Bin Rashid Al Maktoum Medical Sciences Award, launched the opening of the International Pediatric Summit yesterday. The summit is being held under the patronage of His Highness Sheikh Hamdan bin Rashid Al Maktoum, Deputy Ruler of Dubai, Minister of Finance and Chairman of the Dubai Health Authority and supported by the Sheikh Hamdan Bin Rashid Al Maktoum Award for Medical Sciences at Hilton Dubai - Habtoor City. During his inaugural speech, Dr. Al Hashimi stressed that the UAE's development and modernization process has had a great impact on laying the foundations of medical scientific research at the State level and enriching scientific progress in all fields. This in turn led to the opening of our society to the human sciences and international cultures, which stemmed from the belief of our wise leadership of the importance of developing the health sector and its rise to reach the highest international levels. This was followed by speeches by the President of the Union of Arab Pediatric Societies, Professor Joseph Haddad, Dr. Nawal Al Kaabi, Medical Director of Sheikh Khalifa Medical City and Chairman of the Organizing Committee of the Conference, and Dr. Islam Al-Baroudi, Honorary President of the Conference. 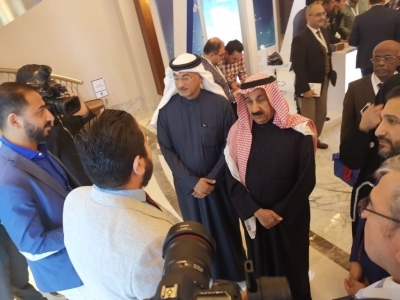 In his speech, Dr. Al-Baroudi stressed the importance of this kind of forum and the leadership of the United Arab Emirates, and its ability in the organization of conferences and scientific meetings. 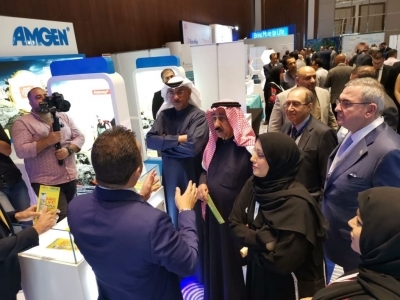 He said that the focus of the Conference this year was on the development of scientific and clinical skills for all pediatric practitioners. The events started with a specialized workshop where Professor Ahmed El-Blida, Professor of Pediatrics at Cairo University, talked about the types of skin allergies and how to prevent them. Professor Joseph Haddad of the University of Balmond also spoke about the methods of weaning and the latest developments in the introduction of food in the stage of childhood. Dr. Ayman Al-Rahmani, Head of Children's Department at Al Ain Twin Hospital, spoke about emergency cases for newborns and how to deal with them. Dr. Nawal Al-Kaabi presented the latest developments in children's material. This was followed by the main lectures of the conference where Dr. Nina Moody, former President of the Royal College of Pediatrics, spoke about all the developments and complications expected to occur in preterm infants and how to deal with them. Dr. Philippe Lizzie then outlined various forms of endocrine and sugar emergencies. Professor Edward Tizano also outlined the latest treatments used to treat muscular dystrophy, while Professor Chris Oklang from Britain explained the different types of cough in children and how to deal with them individually, as shown in other lectures. Professor Giacomo Piassuko of Italy also talked about the need for children in the first year and about the most important ways to prevent and treat vitamin D deficiency. In a specialized workshop, Dr. Surya Al-Rumaithi, Consultant Endocrinology and Diabetes in Children talked about dealing with diabetics at all stages of the day and its control. Dr. Khuloud Khawaja, Consultant Pediatric Rheumatologist, spoke about the treatment of rheumatic diseases. The Emirates Association of Nephrology organized its 38th activity in partnership with the Summit, where nephrologists from the length and breadth of the country discussed both pediatric and adult cases. Dr. Zubaida Ismaili, Consultant and Head of Pediatric Nephrology Department, Sheikh Khalifa Medical City and Dr. Adel Al-Juniby, Consultant Urologist in Sheikh Khalifa Medical City, spoke about the latest methods of diagnosis and treatment of urinary tract disorders since birth. In a specialized workshop for the first time outside the United Kingdom, Professor Majid Jawad, Professor at the Royal College of Britain and Head of the Education Evaluation Committee of the Royal College of the Middle East and the Far East, conducted a specialized workshop on how doctors deal with patients and their families when needed to identify them with bad news of their illness or in the event of bad developments in a professional manner. In specialized scientific workshops for nutritionists, Prof. Sanaa Yousif spoke about the importance of proper selection of high calorie foods for patients with developmental difficulties. In another specialized workshop for clinical pharmacists, participants discussed choosing antibiotics in the best ways as well as the correct process of intravenous feeding.